Cold is coming, and some days it is here, it is time of warm sweaters and leather jackets. Actually, it has been almost four months since I travelled for the last time with all that warm weather, blue sky and strong sun. I went to Mallorca, as you probably know, a lovely island from Spain. My sister and one of my college friends came with me. It was a very funny experience and we came back home perfectly tanned and with a loooot of awesome pics (Oh, yes!) But I am an avid traveller and I always want more and more, last year I went abroad four times and I also visited five times Madrid and of course, Seville, Malaga and Cadiz, because they are one and a half hour from my hometown. To sump up, I am that kind of person with a deep need of exploring, I can’t stay so much time on the same place and my friends tease at me because I’m all the time sending them flight offers. One of my favourite things when I travel is to choose all the beautiful outfits I’m going to wear and one day I will post about my suitcase secrets (I've survived 20 days in Poland with a Ryanair cabin baggage). 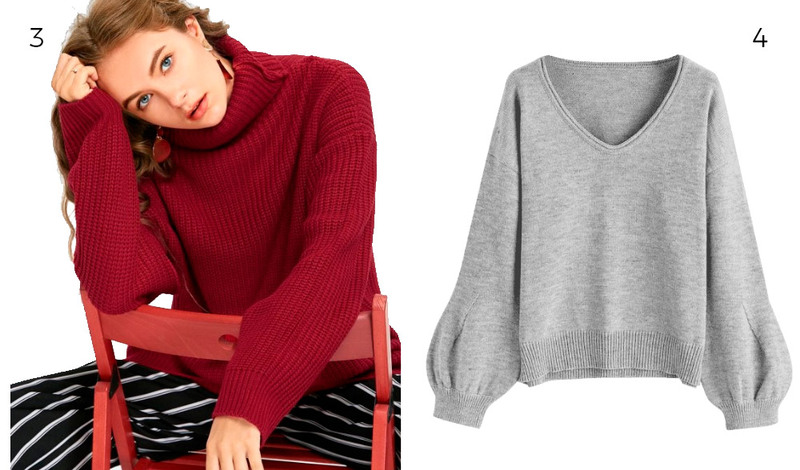 So, if you are going to travel this Fall you need these 4 sweaters from Zaful in your suitcase. Pink V neck sweater. 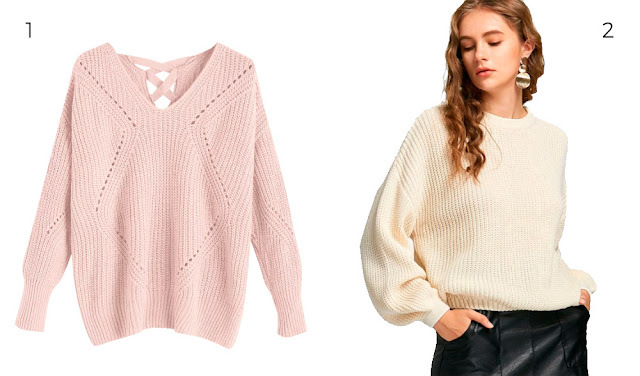 I specially love its criss-cross back that make a common sweater a trend piece. White oversize sweater. With a perfect color that fits with any outfit, its lantern sleeves make me love it. Roll neck deep red sweater. I love it oversize because it will fit perfectly with my black leather mini-skirt. I think it could be the perfect combo. Grey lantern sleeves sweater. You need a grey sweater and if you have one, you need two hehe. I felt in love with that kind of sleeves and maybe this Fall you see it on my more than once. Are you traveling this Fall? What are your favourites sweaters to take with you in this season? I promise to tell you all my travels news! El frío se acerca, y algunos días está aquí, es tiempo de jerseys calentitos y chaquetas de cuero. La verdad, es que hace ya casi cuatro meses que fuí de viaje por última vez con ese tiempo tan maravilloso, el cielo azul y fuerte sol. Fuí a Mallorca, como seguramente sepas, una isla increíble. Mi hermana y una compañera de la universidad me acompañaron y fue un viaje increíble, no paramos de reírnos y volvimos a casa un un moreno que más quisiera yo ahora y con millones de fotos. Pero la verdad es que soy una viajera empedernida y siempre quiero más, el año pasado viajé al extranjero cuatro veces y también visité unas cinco veces Madrid y por supuesto, Sevilla, Cádiz y Málaga que están solo a una hora y media de casa. En fin, soy esa clase de personas con un deseo increíble por conocer lugares nuevos, no puedo quedarme quieta mucho tiempo en un mismo lugar y mis amigos no dejan de reírse de mí porque siempre estoy enviándoles ofertas de vuelos. Una de mis partes favoritas de viajar es elegir todos los outfits que voy a llevarme y prometo hacer un día un post sobre mis secretos para hacer la maleta (sobreviví 20 días en Polonia con una maleta de mano tamaño Ryanair). Así que si estás pensando en viajar este Otoño o Invierno, necesitas meter en tu maleta alguno de estos jerseys de Zaful. Jersey rosa con escote en V. Lo que más me gusta de este jersey es el detalle cruzado de la espalda que lo transforma de un jersey común a una pieza de tendencia. Jersey oversize blanco. Ya sólo el color hace que quede bien con todo, además estoy enamorada de sus mangas. Jersey de cuello vuelto rojo. Me gusta que sea oversize porque puedo combinarlo con mi mini falda negra de cuero. Creo que serían el mezcla perfecta. Jersey gris con mangas farol. Necesitas un jersey gris y si ya tienes uno, necesitas dos jaja. Me he enamorado de este tipo de mangas y es muy probable que este Invierno me las veas mucho. ¿Vas a viajar en este Invierno? ¿Cuales son tus jerseys favoritos para llevar contigo? Prometo poneros al día de todas mis novedades viajeras. Sí!!! Es que se ve taaan calentito. Love the pink v neck. Have a great weekend. It is so lovely hehe Have an amazing weekend babe. That pink sweater is so beautiful! Amsterdam is incredible! I love that city so much... and I have all these things :) have a good trip! I'm looking foward to go there. Yessss!! Red fits with everything. I'm looking foward to go there. Those four sweaters are definitely essential - I'm particularly loving the pink v-neck one. Enjoy your trip to Amsterdam! Hope you'll have fun going to Amsterdam in December! It's so cool that you get to travel to all of these places! I'm not really traveling out far during the fall but I totally agree with the must-haves in your luggage! Yesss to each of this sweater. Love em and definitely needed in my travelling bag. Thank you so much! Have a wonderful week. These look so comfy and perfect for travelling somewhere colder for fall! For sure! I think in December and in my mind come soft and comzy sweaters. I'm totally loving the cream sweater! It looks super comfy and I definitely appreciate my sweaters oversized. Yes! I love oversized too. Thank you so much. Have a nice week. Really? Wow, it is so so pretty. I adore that pink sweater! It is so cozy and it looks so warm. Yes, always need a great cozy sweater! For sure, a soft sweater for cold days. Have fun in Amsterdam! I love the sweaters you picked out.